Using a combination of fastballs and sliders with control and confidence, Bob Gibson capped the most successful stretch of starts ever experienced by a Cardinals pitcher. On Aug. 19, 1968, Gibson got his 15th consecutive win, pitching a two-hitter in the Cardinals’ 2-0 victory over the Phillies at Philadelphia. During the 15-game winning streak, from June 2 through Aug. 19, Gibson made 16 starts, with one no-decision. Ten of the 15 wins were shutouts. His ERA in that 16-start stretch was 0.68 in 146 innings, with 124 strikeouts. He pitched nine innings or more 16 games in a row. “I haven’t seen anybody that good during the time I’ve been in the majors,” Cardinals outfielder Roger Maris said to The Sporting News. Using only fastballs and sliders against the Phillies, Gibson struck out 11, including Richie Allen four times and Bill White three times. Gibson credited the development of his slider with making him a dominant pitcher. “My slider was nasty,” Gibson said in a conversation for the book “Sixty Feet, Six Inches.” “They could look for it and couldn’t hit it. In his bid for the 15th consecutive win, Gibson held the Phillies hitless for five innings. In the sixth, with one out, pitcher John Boozer singled to center. The 15th consecutive win gave Gbson a season record of 18-5 with a 0.99 ERA in 234.2 innings. He needed four more wins in a row to tie Tim Keefe (1888 Giants) and Rube Marquard (1912 Giants) for the major-league record for consecutive wins (19). With his 10th shutout, Gibson tied the Cardinals’ single-season record established by Mort Cooper in 1944. 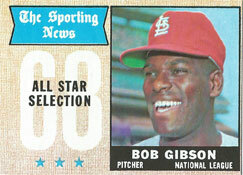 Gibson finished the 1968 season with a 22-9 record, and 1.12 ERA, pitching 13 shutouts and 28 complete games. On Oct. 28, 1968, he was named unanimous winner of the National League Cy Young Award. Two weeks later, on Nov. 13, he was named recipient of the NL Most Valuable Player Award.